Add dimension to your home with a bow and bay window, which will project outward to create a stunning external feature. Bow and bay windows continue to be a popular choice for homeowners UK-wide. The design of each varies, although the benefits are the same. A bow window features a glass projection flanked by others set at angles. A bay window is curved and comprises a picture window offset by two smaller ones. The bow and bay windows we supply and fit for our customers have been sourced from the best UK manufacturers for your peace of mind and are built to last. Find out more about the stand-out features of our range by calling us on 01922 582 351 or use our design tool to generate a bow and bay windows quote. Looking For Bow and Bay Windows Quotes? uPVC Bow and bay windows look stunning and will reward your home with a range of unexpected but welcome outcomes. uPVC Bow and bay windows project outward to provide additional room that could be used as a seating area. This additional space will make your chosen room appear much larger, an especially welcome benefit if your living area is quite small. From the outside, your uPVC bow and bay windows will communicate a sense of presence that will make your home stand out, while also improving its market appeal. This pleasing effect is a direct result of the projected design of the installation. The picture window that takes centre stage with a bow or bay window will direct lots of light into your room. Your designated space will feel more connected to the outside and seamlessly connect to other areas within your home at the same time. uPVC Bow and bay windows own a traditional aesthetic that makes perfect for heritage properties or older builds. Effortlessly achieve that all-important classic look and make the most of your home’s architectural features with this style of window. Our bow and bay windows are made from uPVC, which is a hard-wearing and extremely durable material. The weatherproof profile used in your installation will also prevent wind and rain entering, so your home will be warm and condensation free. Build your ideal bow or bay window by choosing from our extensive colour palette. Create an authentic timber grain feel by adding a foil into the design mix and browse our portfolio of window furniture to add a finishing touch. Using our knowledge and experience of uPVC bow and bay windows, we’ll guide you toward a product that’s perfect for your home. Whether you want a contemporary- or modern-looking design, we’ll work with you to fine-tune the appearance of your installation so that it stands out for all the right reasons. 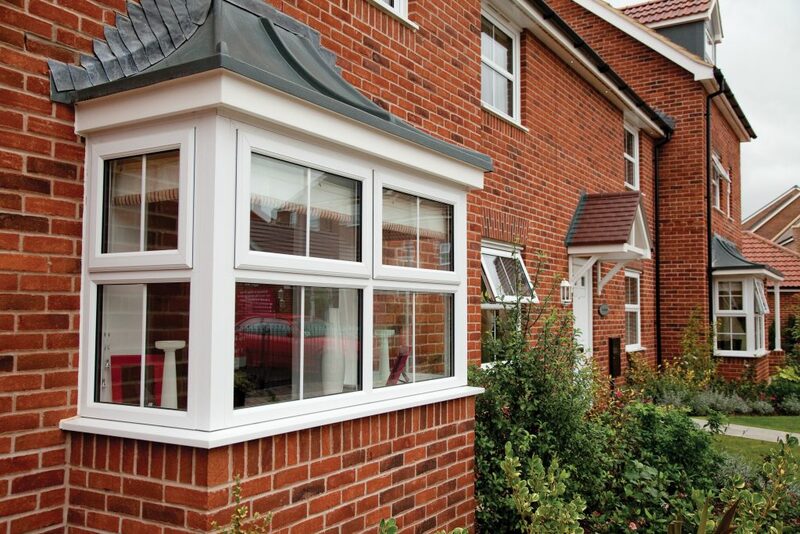 We’ve invested as much time in choosing our bow and bay windows as we have in perfecting our service. To make sure we meet a high standard for our customers, we have joined competent persons schemes – run by the GGF, FENSA and, for example – that independently assess us. We also belong to Which Trusted Traders scheme. For technical advice about our range of bow and bay windows, talk to a qualified and experienced member of the Hertford Glass team today. You can call us on 01922 582 351 or ask us to ring you back by sending us an email. If you want an online bow and bay windows quote, visit our free design tool. Specify your product by entering some basic details – for example, measurements and colour – to generate an instant guideline price.